Describe the Equipment for Sale - Provide us with a full written description of the machinery you have for sale. Include the make, model, serial number, age, how long the machinery was in use, what product was produced, and any other relevant facts. The more we know, the more we can pass on to interested prospects. Take Photos of the Equipment - They say a photograph is worth a 1,000 words, so the more the better. Take several photos from different angles and be sure to highlight any individual aspects that may provide insight to the machinery. Provide Manuals and Supportive Documents - Any manuals, original invoices, or maintenance logs may offer additional information on the machinery. Are there any spare parts available for the machine? Is there an MSDS Sheet (Manufactures Safety Data Sheets) showing what was previously used in the machine? Estimate the Net Cash Value Expected – Determine a net dollar amount you would like to receive for the equipment upon sale. How much cash do you want to complete a sale? Provide the Location of the Equipment - You have the option of keeping the equipment at your location or you can choose to ship to Aaron for storage for an addition cost. We Market Your Equipment – Aaron will list the equipment on our website and will create additional marketing programs to stimulate interest in the equipment. This may include trade journal ads in print and or on the web, and email campaigns to our targeted exclusive lists. Depending upon how aggressive you want to be in selling the assets, we would ask you to agree to an enhanced marketing budget. This would allow us to buy specialty email and mailing lists and also place strategic ads in the appropriate trade journals. We Quote and Work with the Customer – Aaron handles all aspects of customer quoting and correspondence. We will closely work with our customer to answer any questions promptly and we have the fastest quote response time in the industry. We Negotiate the Deal – Once and offer has been made, we negotiate the terms and conditions with the customer. If necessary, we will make arrangements for the customer to visit and view & inspect the machinery. We Provide Activity Statistics – We can provide statistical reports with detailed information about how many times the equipment was quoted; to whom; and when. Additional Marketing Where Needed – Depending upon how aggressive you want to be in selling the assets, we would ask you to agree to an enhanced marketing budget. This would allow us to buy specialty email and mailing lists and also place strategic ads in appropriate trade journals. We Handle the Entire Payment Process – Once a deal is accepted, we handle everything from the deposit to the entire payment collection process with the customer. If the equipment is shipped to Aaron for storage, Aaron would receive a fixed commission of 25% on the gross sales amount upon a sale. 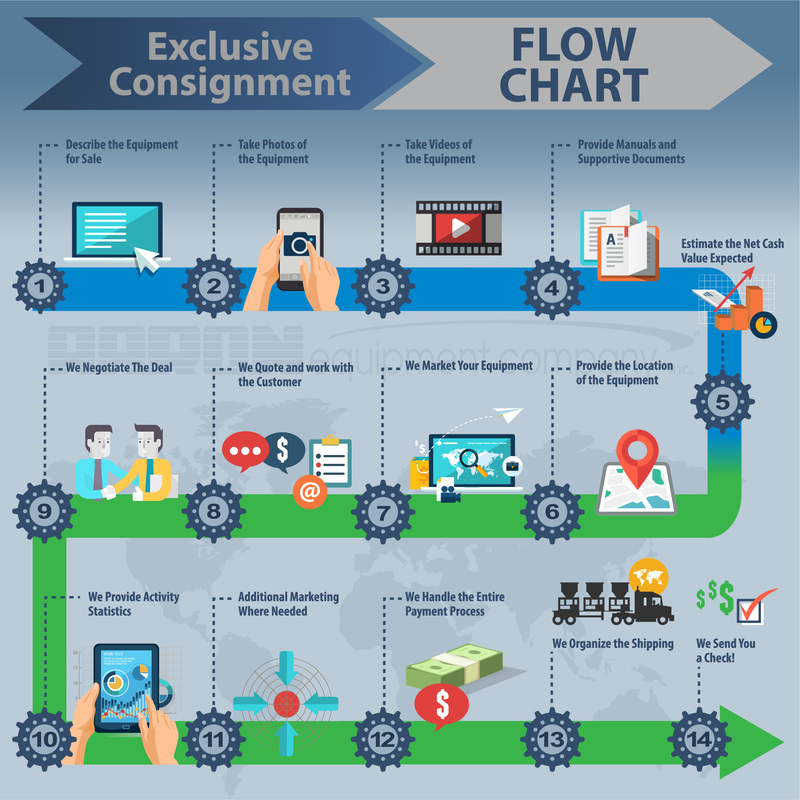 If the equipment is kept at your location for the duration of the consignment, Aaron would receive a fixed commission of 20% on the gross sales amount upon a sale. We Organize the Shipping – If needed, we can assist with shipping and rigging of the machinery to the desired destination or work with a specific carrier. We Send You a Check! – Payment is collected before the equipment leaves the site. Aaron Equipment guarantees payment to you within 5 working days of shipment. We can pay you via wire transfer or company check via overnight delivery. All sales are “As Is”.